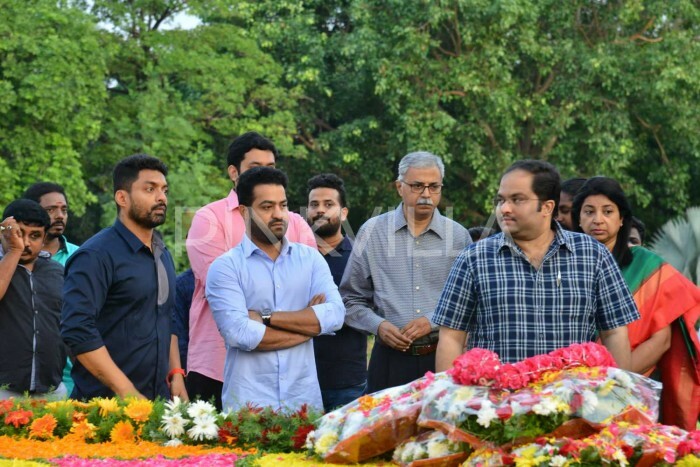 On his birth anniversary today, his family members including Grandsons Jr NTR and Nandamuri Kalyanram, son Harikrishna and family members paid a visit to the NTR ghat in Hyderabad and paid their homage to NTR. Coincidentally, Krish would be directing a biopic on NTR which will have son Nandamuri Balakrishna playing his father in it. The biopic is titled NTR and is being produced by Balakrishna himself jointly with Vishnu Induri. the shooting of the biopic will begin soon and the makers may be aiming it to release during Sankranti in 2019.